Recently I have been all about achieving my cooking goals- utilizing ingredients, or methods I haven't tried before, and mastering them. Over the weekend I found beautiful short ribs at a local butcher shop- and since Ive never made short ribs before, I decided that it was about time I made them. Short ribs are a really great cut of meat. They are more tender, and much meatier than a pork rib which I often find doesn't contain that much meat. The typical way to serve them is braised, or slow cooked in liquid. Normally I hate to follow recipes when I cook- Id prefer to experiment with what I feel tastes right, and "wing it". However- I wanted some guidance in making the short ribs so I went recipe searching. I found one that included making a puree of mirepoix- and since I love using my Cuisinart- I decided that was the one for me. From there- I made the recipe my own. To start, I heated a couple of teaspoons of olive oil in the bottom of a big skillet pan, and added fresh thyme to infuse the oil. Once it was hot, I lightly salted and peppered the ribs, and then added them to the pan. I browned them on each side and then pulled them from the heat. As the meat was searing, I started to prepare my puree. I rough chopped carrots, celery, an onion and a couple of cloves of garlic, placed it all into the Cuisinart and began to puree it. Once most of the big pieces were gone, I added in thyme, oregano, sage and parsley to the mixture and continued to the puree the vegetables. Once their consistency was basically of sand, slightly granular, I poured the mix into a double boiler pot oiled, and cooked it over medium high heat for about ten minutes, stirring occasionally. I added just a small amount of salt and pepper to this mix. Once the juices really started to flow from the veggies, I added a cup and a half of a good dry red wine, and two cups of beef stock. After that came to a boil, I gently placed the ribs into the pot, loosely covered it, and lowered the heat to a simmer. They were then ready to cook for about three hours in that liquid. I decided to make some oven potatoes for a side dish, so I went to work peeling the potatoes, slicing them into strips, and then I boiled them until they were soft. After removing them from the hot water, I rinsed them under cold water to stop the cooking process, and then laid them out in a single layer on a cookie sheet. I tossed them lightly in vegetable oil, chopped garlic, thyme, oregano, hot pepper flakes, salt and pepper. Then I put them off to the side until it was closer to dinner time. Finally, I rough chopped some more garlic, placed it into the bottom of a small sauce pot, placed my steamer basket on top, and added water til it just reached the level of the bottom of the basket. Then I just removed the tops of some sugar snap peas and added them to the pot- when it was time to eat, they would just need to be turned on and steamed for about 6-7 minutes. The great thing about braising is that it leaves you a fair amount of time to relax while its cooking. Side dishes were ready to go, and I had a good 45 minutes to an hour before I had to do anything else. So relax I did-iTunes got some good business from me. Finally though, it was time to put the potatoes in the oven. I knew they would take about a half hour to forty five minutes to crisp up in a 400 degree oven so in they went. The three hours were up so I pulled the ribs from the pot. Now I know that short ribs are supposed to be "fall off the bone" tender, well- the bones were no long even a part of meat. I placed them on a plate, covered them with tin foil and put aside. Then it was time to start working on my gravy for them. I strained the veggie puree from the stock, then made a roux of butter and flour. Then I added the hot stock to the roux and mixed it with a wisk to eliminate any lumps. As it began to thicken, I added a few tablespoons of dijon mustard to add some extra flavor. Once the gravy was completed, I turned on the sugar pea pot, allowed them to steam, and then pulled the potatoes from the oven. Brown and crispy these looked delicious. 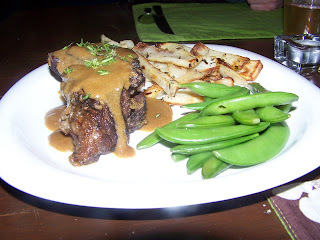 I pulled the meal together by placing a couple of short ribs on the plate, spooning some gravy over the top and then sprinkling some thyme for color. I placed some potatoes and the peas on the side, and a very pretty dish was served. It is not often that I like to say that I'm impressed by my own cooking, but this was an easy meal that really pulled together well. The meat was tender and incredibly flavorful. The gravy had a really beautiful flavor to it- complete with a great tang from the mustard that complimented the earthy vegetables in the puree. The oven fries tied in beautifully- lots of good flavor that mimicked the flavors of the ribs, crispy on the outside, soft inside. Really delicious-and a good dunker for that fantastic gravy. The sugar peas at least gave the idea that it was a slightly healthy meal- light and crunchy- a perfect compliment to the rest of the meal. I will definitely be making a lot of this meal, and I'm sure Ill vary it up quite a bit along the way. It was more than delicious.